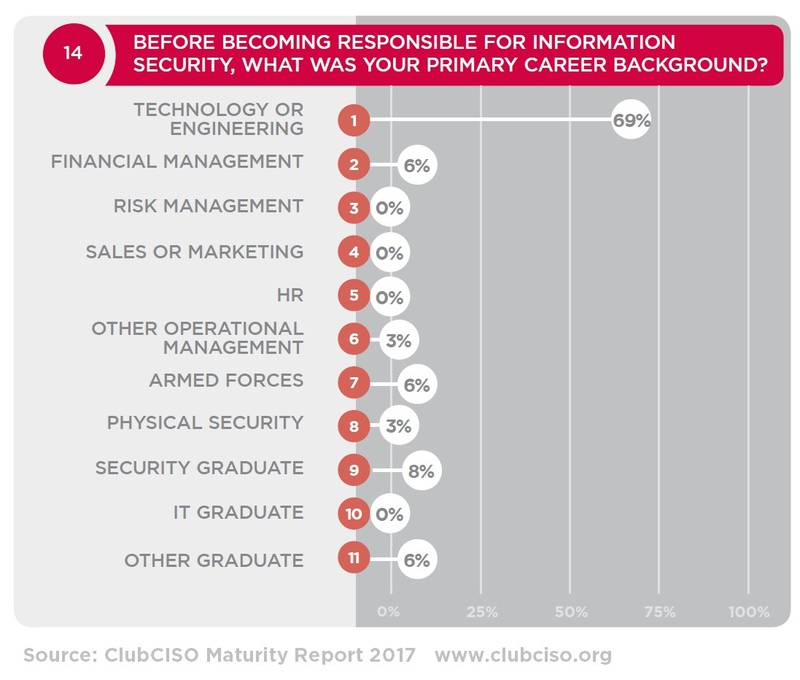 All the statistics featured on this website may be freely referenced and downloaded, citing source: ClubCISO IT Security Maturity Report. All content © ClubCISO/Company85. 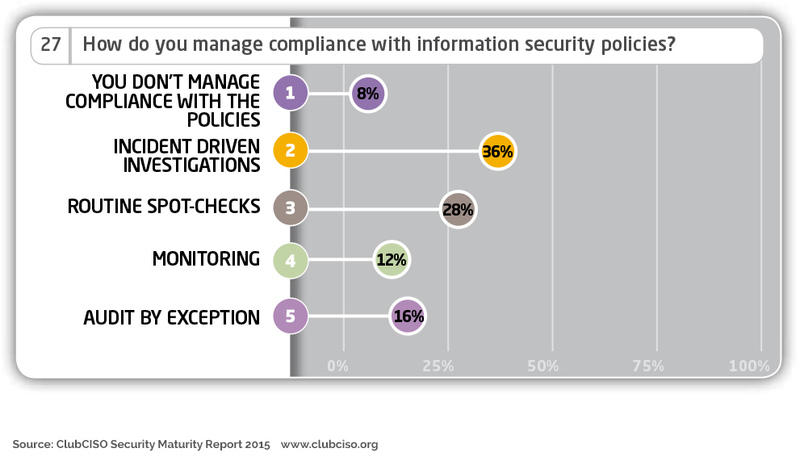 Within your organisation, where does the information security function report? 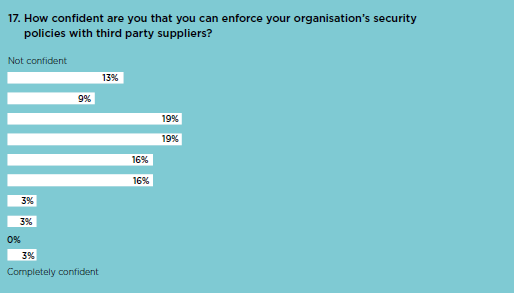 How confident are you that you can enforce your organisation’s security policies with third party suppliers? How aligned would you say the security function is to the overall strategy of the business today? 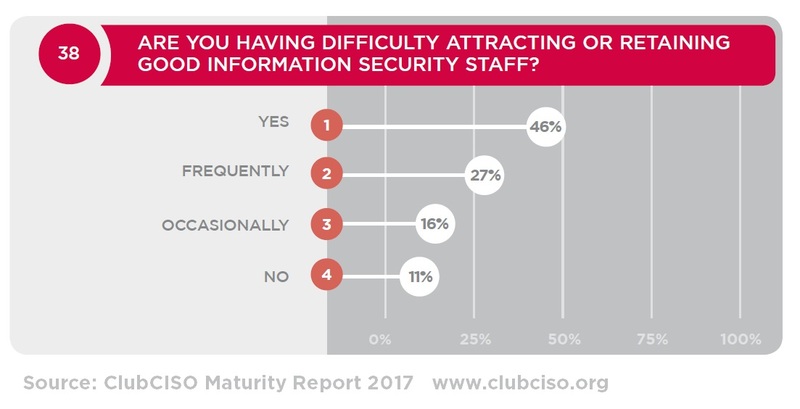 Are you having difficulty attracting or retaining good information security staff? 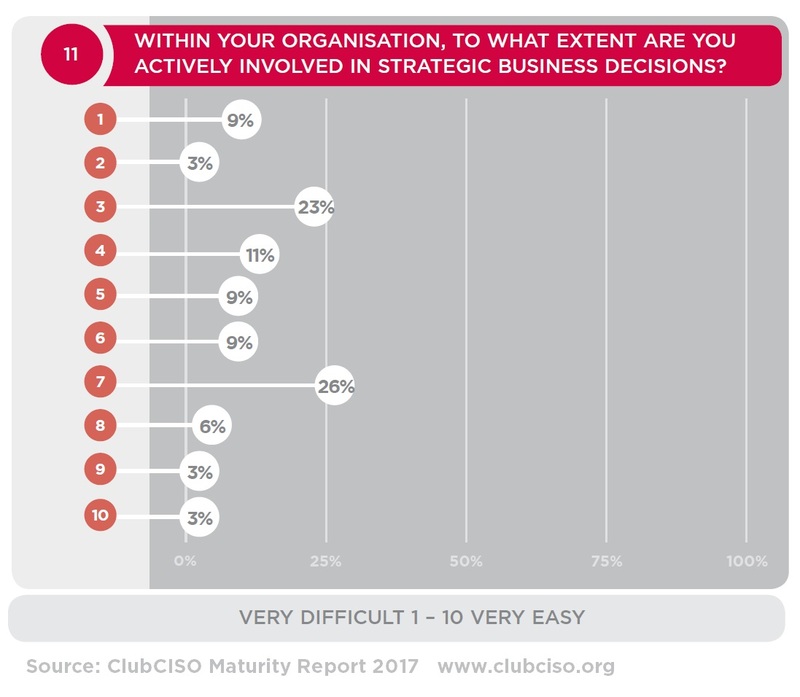 Within your organisation, to what extent are you actively involved in strategic business decisions? 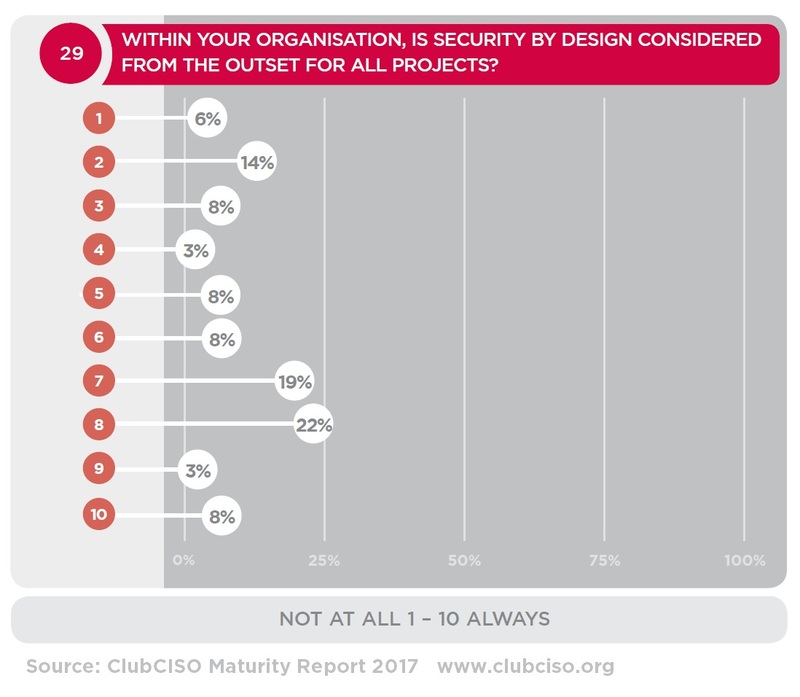 Within your organisation, is security by design considered from the outset for all projects? 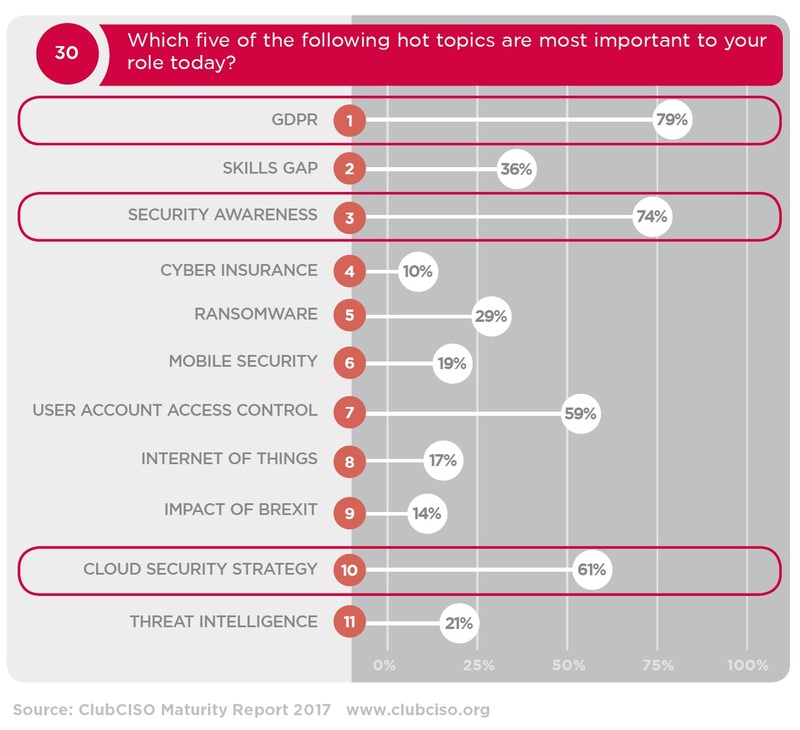 Which five of the following hot topics are most important to your role today? Rate your organisation in terms of readiness for GDPR. 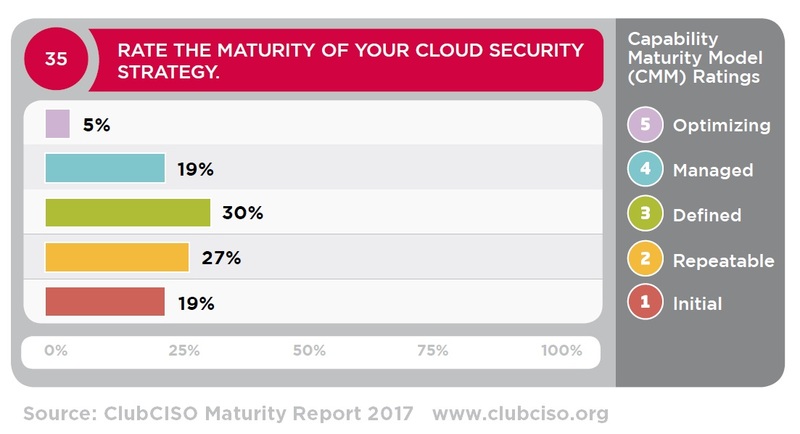 Rate the maturity of your cloud security strategy. 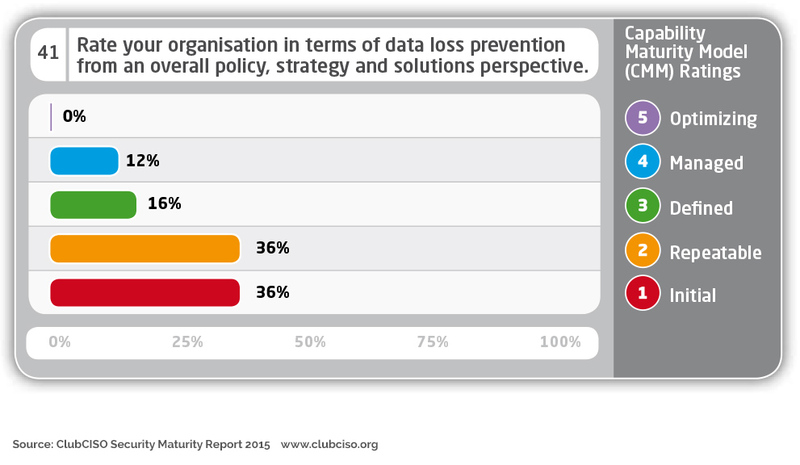 How is your organisation positioned for cyber insurance? 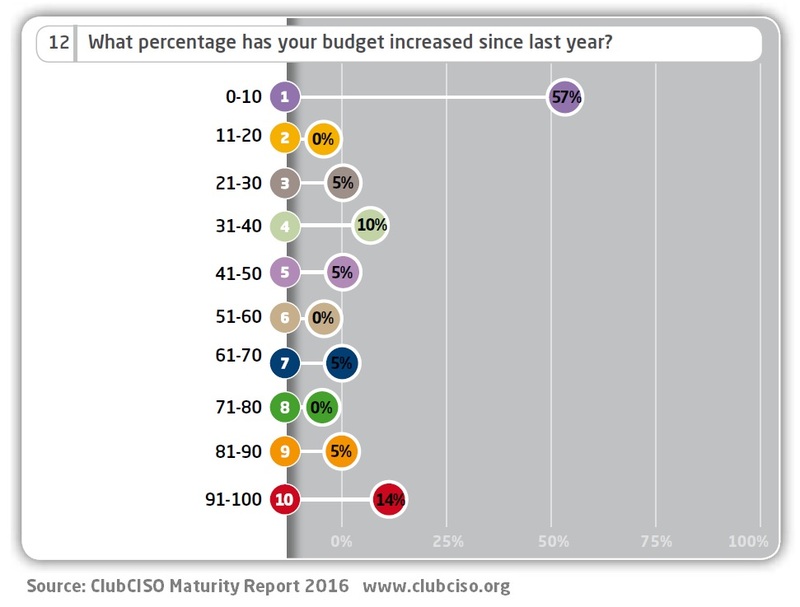 Describe your organisation’s current information security budget. Before becoming responsible for information security, what was your primary career background? 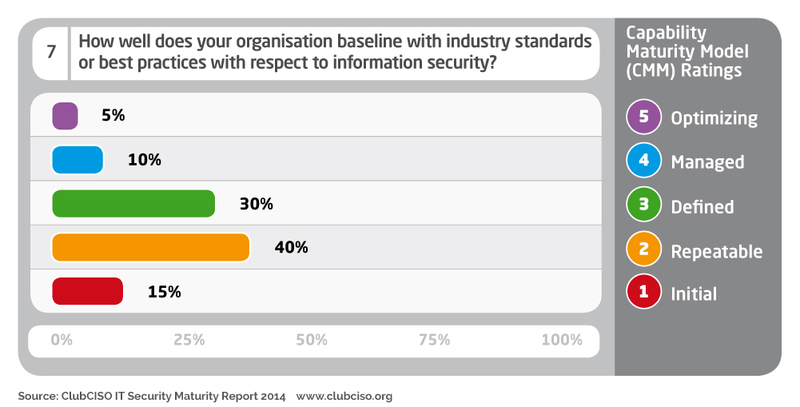 71% of respondents say that all senior executives in their organisation need further security education. 70% of CISOs say that information risk is treated the same as corporate risk in their organisation. 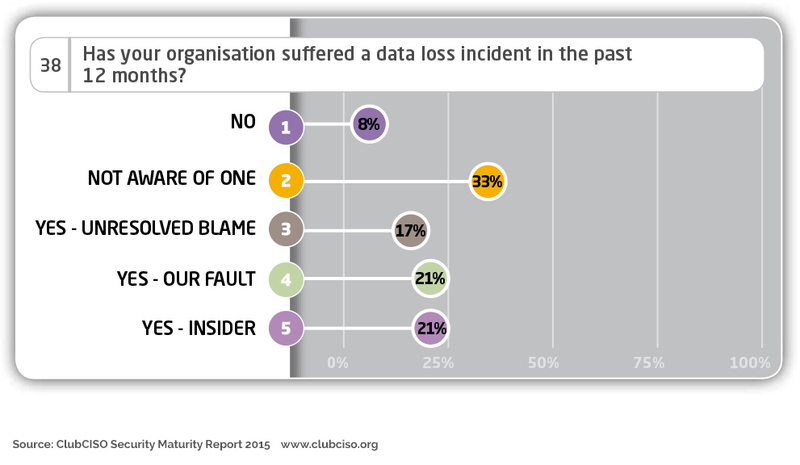 69% of respondents have suffered a data loss incident in the past 12 months. 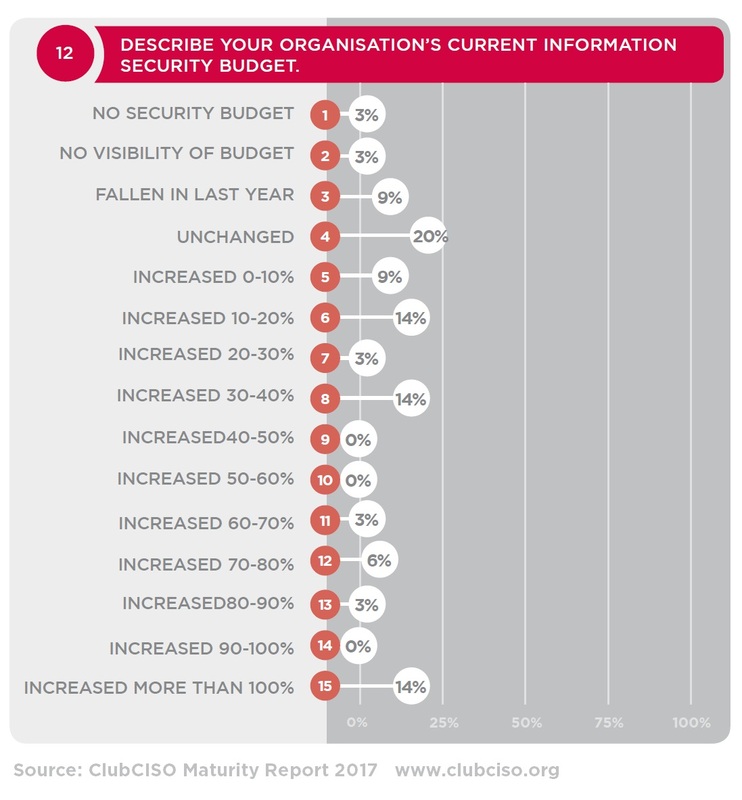 57% of security budgets have only increased by between 0-10%. 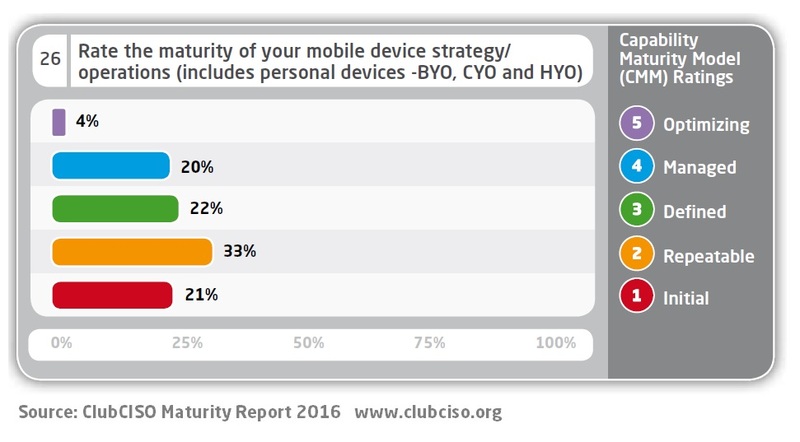 54% of CISOs rate their mobility maturity at only the ‘Initial’ or ‘Repeatable’ stages. 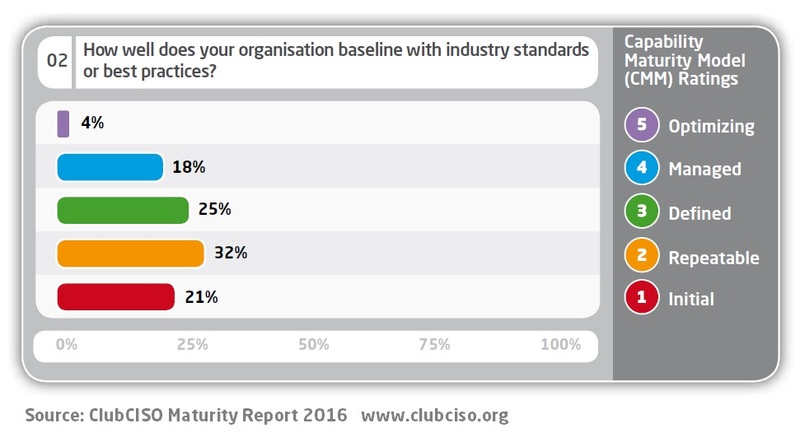 53% of organisations rate themselves as only ‘Initial’ or ‘Repeatable’ against industry best practices. 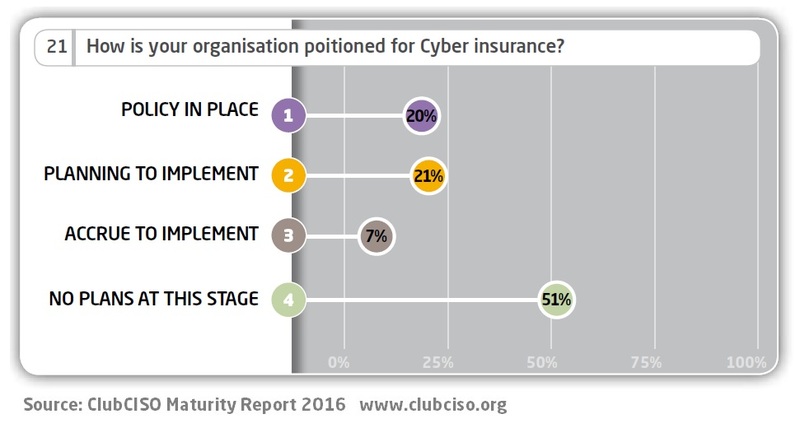 51% of respondents have no imminent plans to implement cyber insurance. 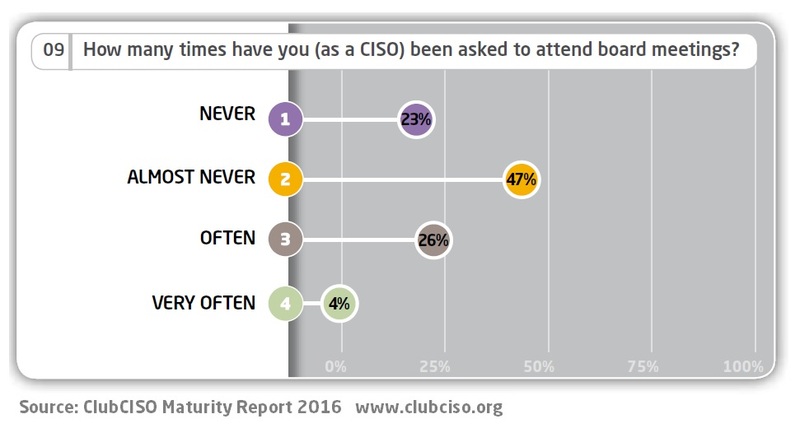 47% of CISOs are ‘almost never’ asked to attend board meetings. 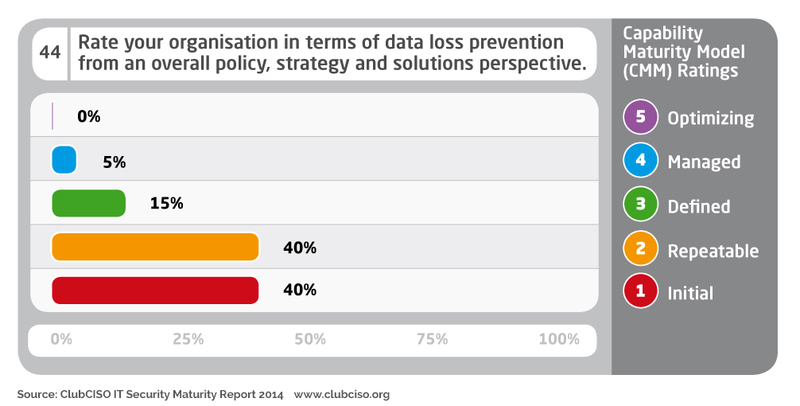 41% of organisations say their security staff retention has got worse over the last 12 months. 38% of organisations rate themselves as only ‘Initial’ in terms of GDPR readiness. Only, 12% of the organisations surveyed manage compliance with information security policies with continuous monitoring. 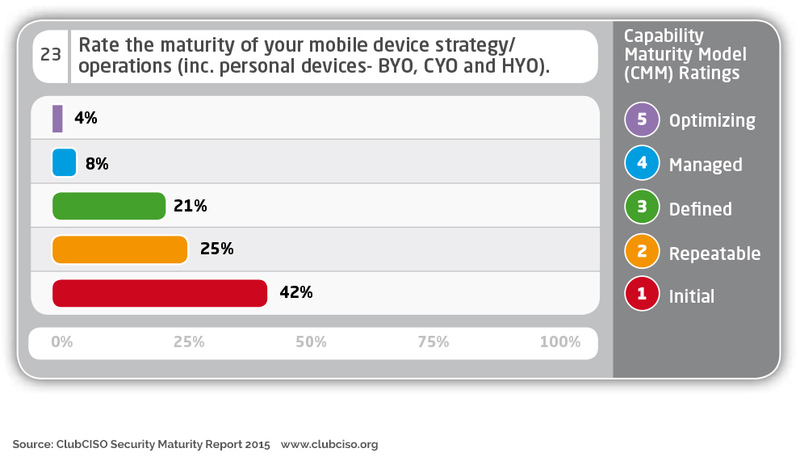 42% of the organisations surveyed rated their maturity of their mobile device strategy/operations (including personal devices – BYO, CYO and HYO) as poor. 62% of the organisations surveyed said their information security is generally seen as a cost centre. 32% of CISOs rate their 3rd party supply chain as poor. 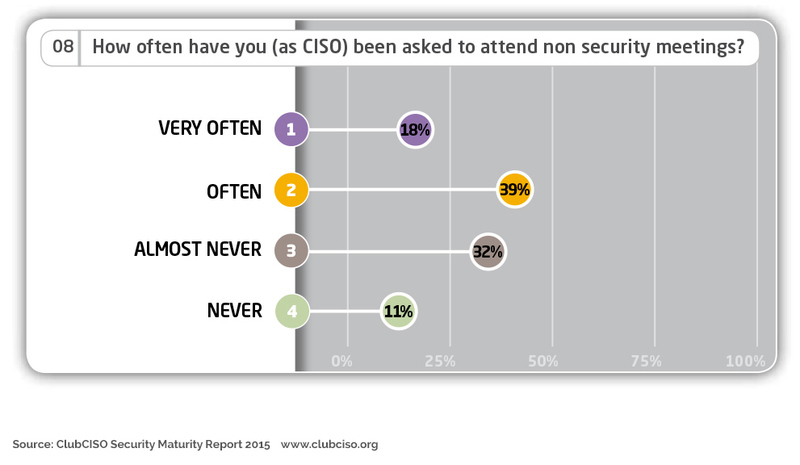 39% of CISOs are often asked to attend non security meetings. 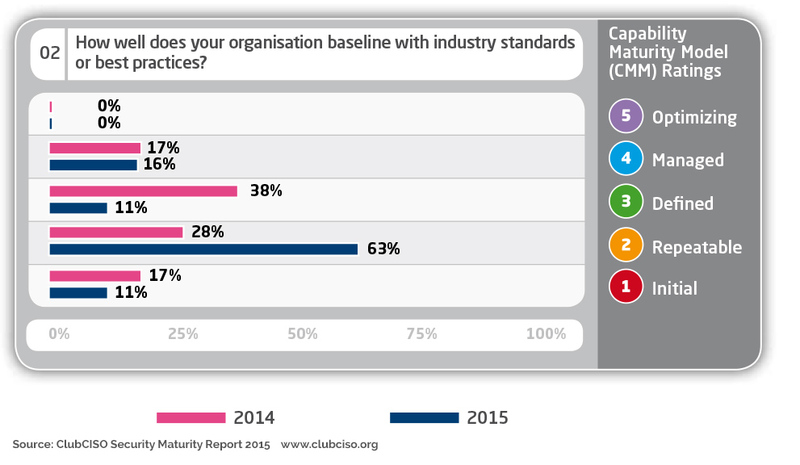 63% of organisations rate themselves as repeatable on the CMM model when it comes to meeting industry standards or best practices. 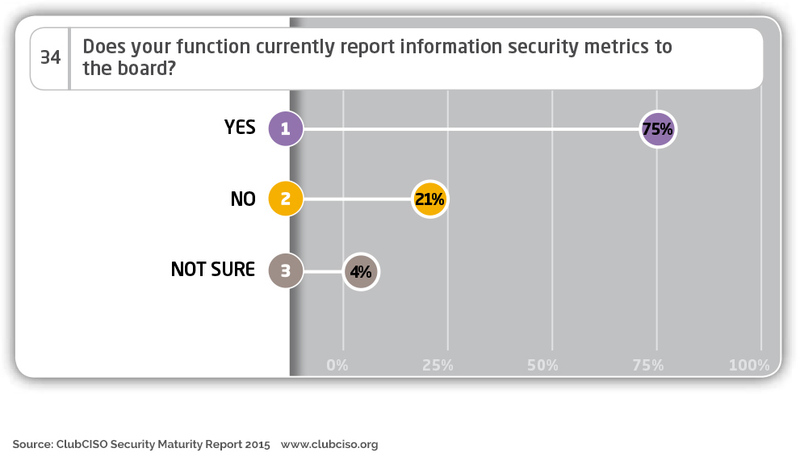 75% of the CISOs surveyed report information security metrics to the board. 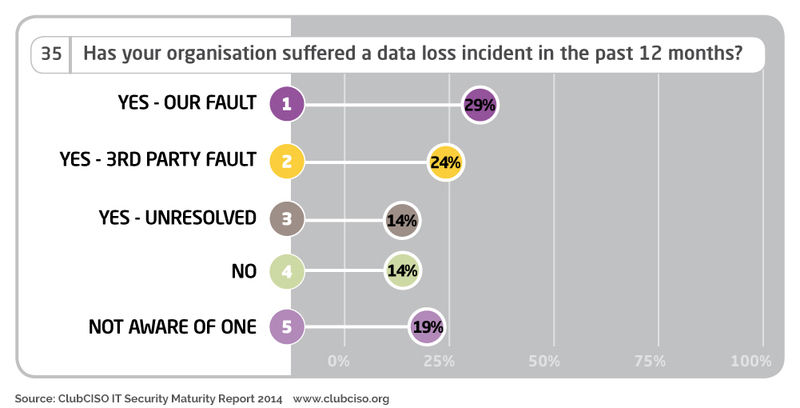 Only two-thirds of CISOs surveyed remain confident they have not suffered data loss incidents. 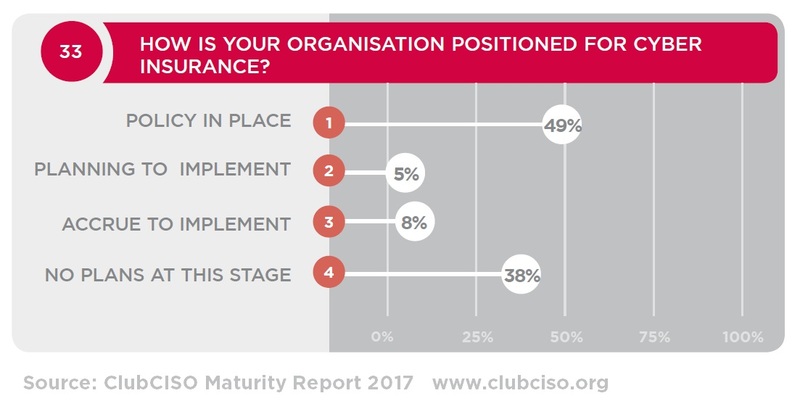 Four-fifths of CISOs surveyed are at the lowest two CMM levels when rating their organisations data loss prevention from an overall policy, strategy and solutions perspective. Education and clear allocation of responsibilities were scored as most important when CISOs were shown The Government’s ’10 steps to online security for SMEs’. Two-thirds of respondents said their third-party supply chain had an immature information security posture. 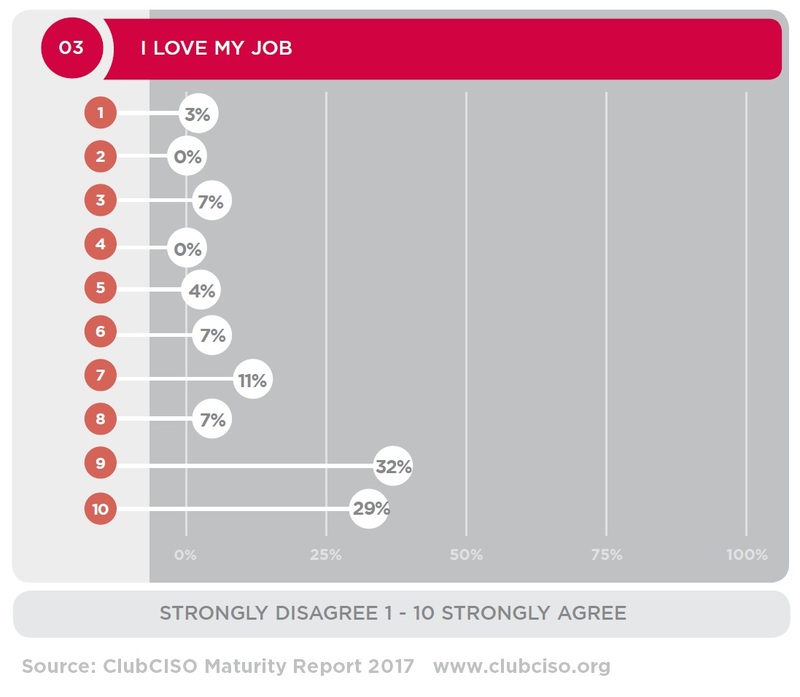 Almost 75% of the CISOs surveyed rated their organisation at only level 1 (Initial) or level 2 (Repeatable) on the Capability Maturity Model (CMM). 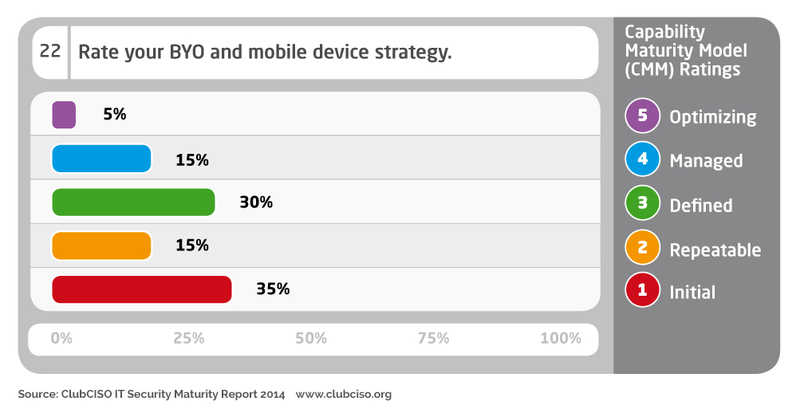 50% of UK CISOs surveyed describe their BYO and Mobile device strategy as unpredictable and reactive. 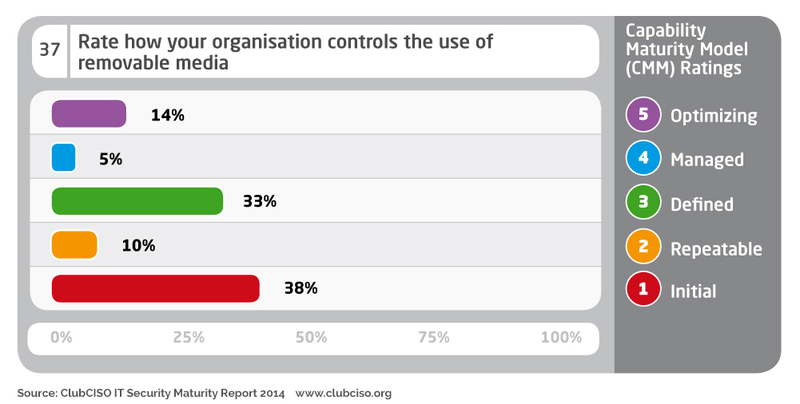 Only 14% of the UK CISOs surveyed describe their control of removable media as mature. Only 34% of the UK organisations surveyed have a mature cyber-breach response programme. 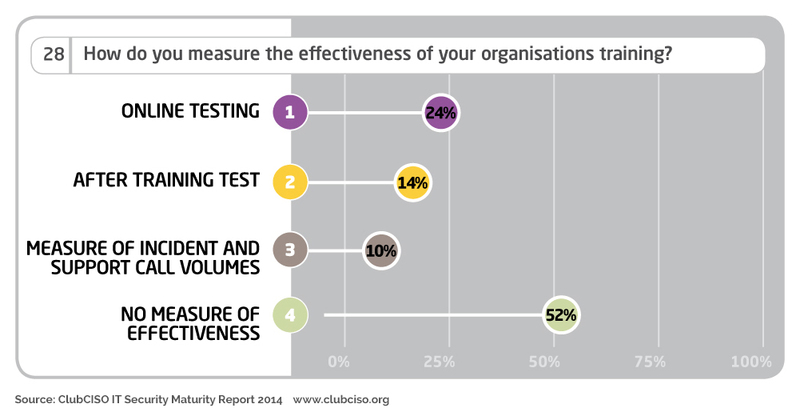 52% of the UK organisations surveyed have no measure of the effectiveness of their security awareness training. 21% of the organisations surveyed never provide any security awareness training for their employees. 57% of the UK organisations surveyed have only partial or no SLAs with third parties to transfer or share responsibility in terms of breach of data loss. Less than half of the CISOs surveyed said their organisations were well aligned with legal and regulatory requirements. 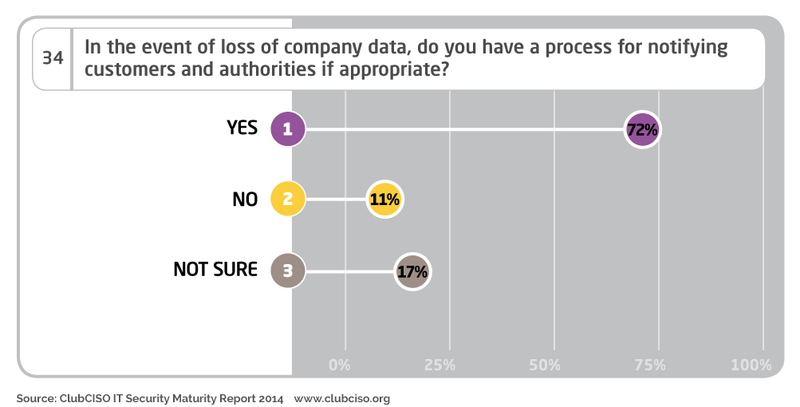 72% of UK CISOs surveyed have a process for notifying customers and authorities in the event of a data loss. 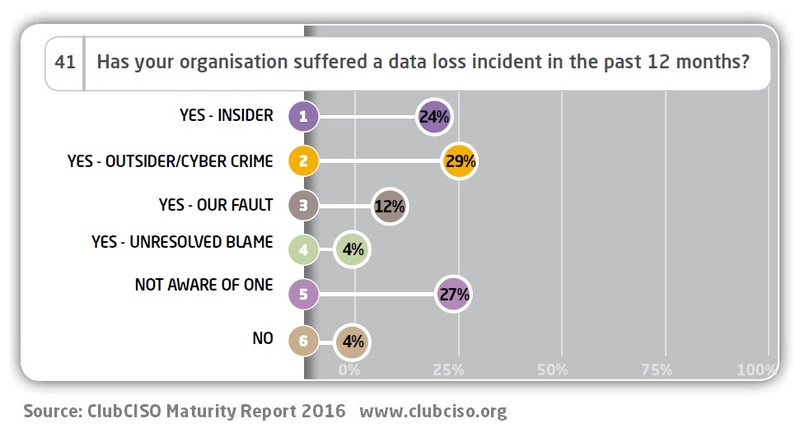 67% of CISOs surveyed have suffered a data loss incident in the past 12 months.